It seems that my days of sleeping at night may already be over. I’m 38 weeks now, technically (because it’s 1 in the morning), and for the third night in a row I am up up up. Two nights ago I blamed the nap I’d taken around dinnertime for the fact I couldn’t fall asleep until 7am, although it was okay because then I got the bed to myself Last night I managed to fall asleep on the futon after making myself warm milk around 2 and again moved back to bed once Matt left for work. Tonight I felt sleepy when I went to bed, but no matter how much I let my mind drift, it just never shut down. So I tried the futon again, and now I am working on another favourite strategy when I can’t sleep – eat something. The Truck has been very active all these last three nights as well. I can’t say if it’s anything special because I usually sleep through whatever fun it gets up to. During the day I do feel stretching and kicks and squirms, but those movement are nothing compared to the dance parties the Truck gets up to when I am laying still resting. Like, star-jump dance parties. Of my whole pregnancy, I think this past week has passed the slowest. I think when I first hit 37, I felt like “wow this baby could actually come any day!” and by now I have settled into a more relaxed mentality that the baby could come, but it could also chill for another month so… meh. I have been taking all my vitamins and eating lots and resting plenty because I know the end is in sight! And the end is when things actually get tough, so even when I can’t sleep at night I’m not wasting energy stressing out about it. I will sleep when my body wants to sleep, and I will eat 6% m.f. 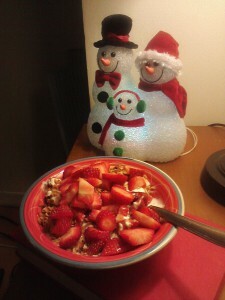 yogurt with granola and strawberries when my body wants to do that instead. You are welcome, Baby, for all these delicious calories! Last night Matt and I went to a home birth seminar hosted by our midwifery clinic, so we got to see all the equipment a midwife brings to a birth and to hear some home birth stories. It was interesting because all three women who shared their stories had such different experiences (one delivered her daughter in a birth pool, one wanted nothing to do with water her whole labour, no showers or baths or anything, and one (the midwife hosting the seminar) ended up transferring to the hospital because her baby would not descend and needed a vacuum), but despite the differences there were also such strong commonalities of what a powerful experience it was. Oh, and also two of the women said they reached a breaking point and were begging to just be cut open so the baby could be out; apparently that’s part of labour for a lot of women, lol. Matt and I had a good chat on the way home about our hopes for my labour and delivery but how we are both flexible in that because we just don’t know what we’ll be faced with. I still don’t want any unnecessary interventions, but I am not going to get so hung up on what I want to happen that I can’t cope with a change of plans. Hopefully. I guess I shouldn’t plan to not have a meltdown either, since that is completely possible, especially in the heat of labour. Oh dear. Speaking of meltdowns. I just checked thebump.com to see what my fruit-of-the-week is (this is just for fun, by the way, it doesn’t actually give me a better idea of how big the baby is; its monster stretches do that quite well). 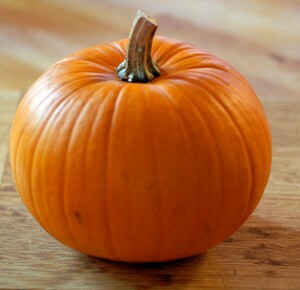 For week 38, the baby is the size of a PUMPKIN. This is now an image that I need to erase from my mind because… there is a reason God did not make babies pumpkin-shaped, and that is because birthing a pumpkin would… would reduce a pregnant woman to stammering, mind-swearing despair.